Angelou, Maya. All God’s Children Need Traveling Shoes. New York: Random House, 1997. Print. Angelou, Maya. And Still I Rise. 1978, Print. Angelou, Maya. Celebrations: Rituals of Peace and Prayer. New York: Random House, 2006. Print. Angelou, Maya. Even the Stars Look Lonesome. New York: Random House, 1997. Print. Angelou, Maya. The Heart of a Woman. New York: Random House, 1981. Print. Angelou, Maya. I Know Why the Caged Bird Sings. New York: Random House, 2002. Print. Angelou, Maya. I Shall Not Be Moved. New York: Random House, 1990. Print. Angelou, Maya. Letter to My Daughter. New York: Random House, 2008. Print. 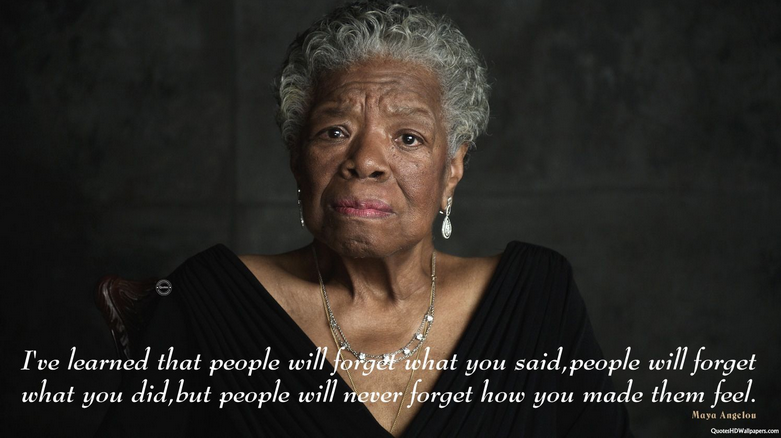 Angelou, Maya. Mom & Me & Mom. New York: Random House, 2013. Print. Angelou, Maya, Maya Angelou, Maya Angelou, Maya Angelou, and Maya Angelou. Poems. New York: Bantam Books, 1997. Print. Angelou, Maya. Singin’ and Swingin’ and Gettin’ Merry Like Christmas. New York: Random House, 1976. Print. Angelou, Maya. A Song Flung Up to Heaven. New York: Random House, 2002. Print. Feelings, Tom, and Atha Tehon. Soul Looks Back in Wonder. New York: Dial Books, 1993. Print. Angelou, Maya. Wouldn’t Take Nothing for My Journey Now. Hingham, Ma: Wheeler Pub, 1994. Print. It is hard to describe the depth of emotion that the transitioning of such a great woman evokes in me. I am torn between the great sense of loss to our world and the joy I feel for having had her in our world to start with. As teacher, poetic, artist, activist, dancer, author, cook, and lover of life and all human beings, this great woman left traceable footprints for us all. The life, the well lived life, she shared with us, leaves us in the midst of a huge vacuum without her. As she has departed from us, her life’s example remains to challenge us. The challenge is to live and to love to the fullest, give of yourself for the betterment of not just you but for the betterment of others. Be public and private at the same time. Love people end hate and fear. Be Godly and true. Be the most and best authentic you that you can be, ever striving for better. This is what she gave to all and this is what she means to me! God blessed her, she blessed us and now God is resting her.